It's time to embrace the future. Launching a new car can be difficult. Automakers need to spend a ton of money on commercials, web ads, and other forms of marketing to make consumers aware of their new product. This becomes even more difficult when the new vehicle is an electric car, a segment that many average consumers are completely unfamiliar with outside of Tesla. The 60-second commercial calls out and debunks a few common misconceptions about EVs. The first is range anxiety, which has already been addressed by most modern electric cars. The new e-tron can travel around 204 miles on a single charge, which should be plenty given that the average luxury buyer only drives 30 miles per day. When those buyers do need to take a longer trip, they can always rent a gasoline-powered car. Audi also addresses recent reports that EVs lose a significant portion of their range in cold temperatures. This may be true of other EVs but the e-tron's intelligent thermal management system makes sure the batteries remain at peak operating temperature. Even though most car trips in the US are under 50 miles, many people still believe they won't find a place to charge their EV when on-the-go. 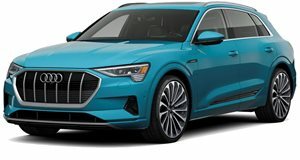 The current charging infrastructure may not be great buy Audi points out that Electrify America plans to install nearly 2,000 chargers in 42 states by the end of 2019. On a fast charger, the e-tron can add 163 miles of range in 30 minutes, or 54 miles of range in just 10 minutes. The final misconception has to do with speed. In case someone still hasn't seen an internet video of Tesla's Ludicrous mode, Audi wants people to remember that the e-tron can hit 60 mph in just 5.5 seconds, making it plenty fast for most buyers. We take a ride into the near future. Audi’s first all-electric production car is now a reality. We travelled to Abu Dhabi to find out how good it is.